Apparently Radio Is Alive and Well! At Least For The Next Five Years. Posted by Sherri & filed under Media. From Marketing Charts – while a recent survey found a majority believing that in 5 years, Americans will primarily listen to streaming radio versus traditional AM/FM radio, another study, this time from Clear Channel Media and Entertainment (CCM+E), begs to differ. According to the “State of Listening in America” study, 69% of respondents agree that “streaming services do not replace radio.” Other results from the survey suggest that radio is alive and well: 92% of respondents said they listen to radio at least once a week, while 71% say it’s part of their daily routine. A recent report demonstrated that radio benefits from its ability to trigger emotional connections from listeners, and the latest study from CCM+E supports that finding. Specifically, 72% of respondents believe that radio feels more “human” than the internet, and 65% feel it is more “personal” than TV. 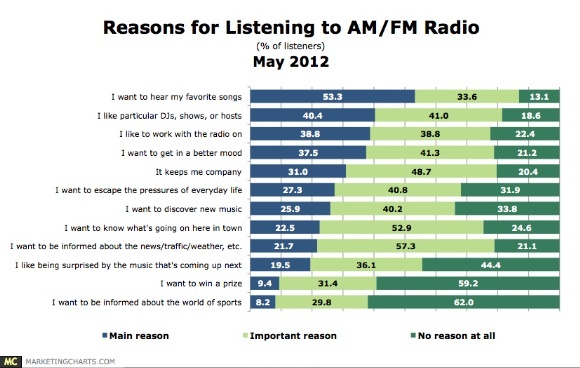 Not only that, but two-thirds agree that their favorite station reflects who they are as a person. Those personal connections mean that 78% agree that radio can make a difference in the community and 72% feel that radio is more community-oriented than TV. • 8 in 10 respondents say radio is helpful in discovering new artists or songs, a finding that aligns with research from both Nielsen and Jacobs Media. • Respondents view radio ads more positively than ads on TV, the internet and mobile applications. • 78% say they can access radio anywhere, and 85% agree that radio has become more accessible. Key findings for west Michigan advertisers to consider: Two-thirds of those surveyed agree that their favorite station reflects who they are as a person and in a brand loyal market it’s crucial to survey your customers to find out what they are listening to. Also, respondents have a more positive connection with radio messaging than TV or the internet, so develop strategic creative and potentially tie in station talent endorsements to maximize your budget. About the Data: The data is based on a survey of more than 1,000 respondents, conducted by Latitude Research and OpenMind.